Deciding on a starting point, I thought this would make a fair continuation to where I last stopped - the Laksam Kelantan. 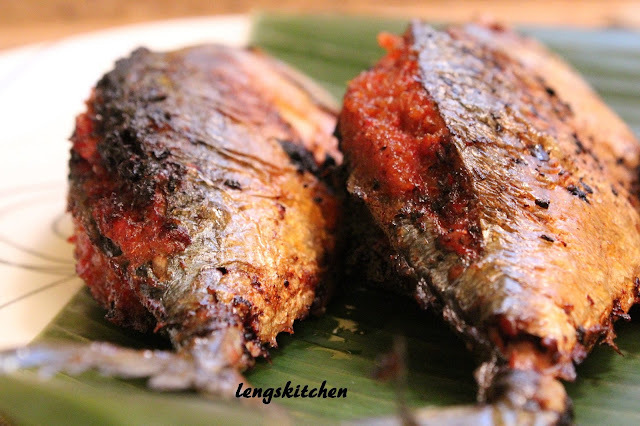 Not directly related in any ways, their similarity simply lies on the fact that they share a common ingredient in both their makings - the Indian mackerel fish (better known as the Ikan Kembung in Malaysia). I chanced upon the Indian mackerel fish not that long ago - probably just a couple of months back - but I was truly thrilled to have found it in one of the Vietnamese grocery stores around where we live. And that finding almost immediately sparked off plenty of ideas as to what I can now make and cook out of it - all of which are some specialties of Malaysian cuisine - mostly those that I am rather familiar with, others not so. And I started off with the Laksam Kelantan in conjunction to the Malaysian Food Fest (MFF) Kelantan Month held by Gertrude from My Kitchen Snippets last month. 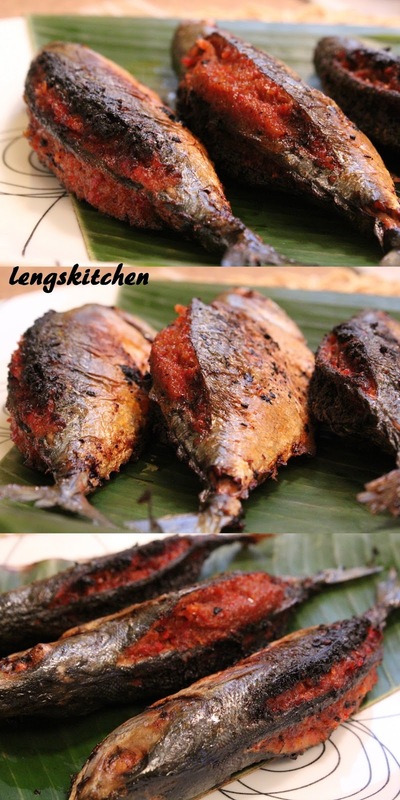 This Sambal Stuffed Mackerel 参巴塞 Kembung 鱼 was one of my mom's specialities, my dad's all-time favorite despite the fact that he had always disliked fish (for their bones and the danger they pose! lol)! Yup, this was his one and only exception. But seriously, anyone who have tried this would have easily fallen for this too. 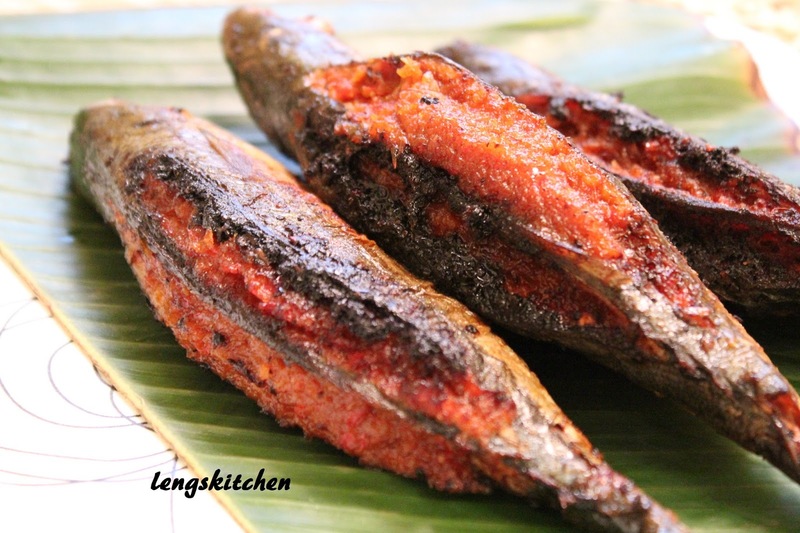 Nothing like the usual steamed of deep fried, this Sambal Stuffed Mackerel 参巴塞 Kembung 鱼 is just so delectable (and even that hardly justify how good they really are!). And obviously, it is the sambal that makes it all special - spicy, salty with a tad of sweetness and tanginess from the tamarind. Stuffed and then pan fried to give them a slightly charred look (and crispiness at some parts while the firm flesh within not at all jeopardized), they are seriously finger-licking good and best had with rice! And just like how my dad had obviously decided back then - going bare hands and picking at the fish bones in this case was just worth it all! 1. 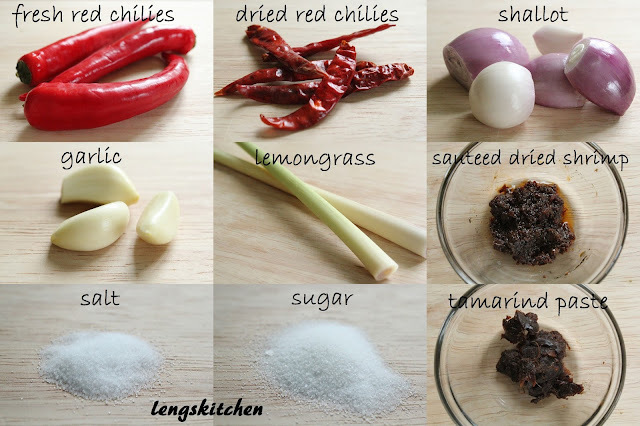 In a mini food processor, blend the fresh red chilies, dried red chilies, shallots, garlic and chopped lemongrass into a smooth paste. Set aside. 2. Add 1/4 cup of water to the tamarind paste. Squeeze to extract the tamarind juice, discarding the seeds/pulp after that. 3. Heat up the wok with about 3 tbsps of cooking oil over a medium heat. 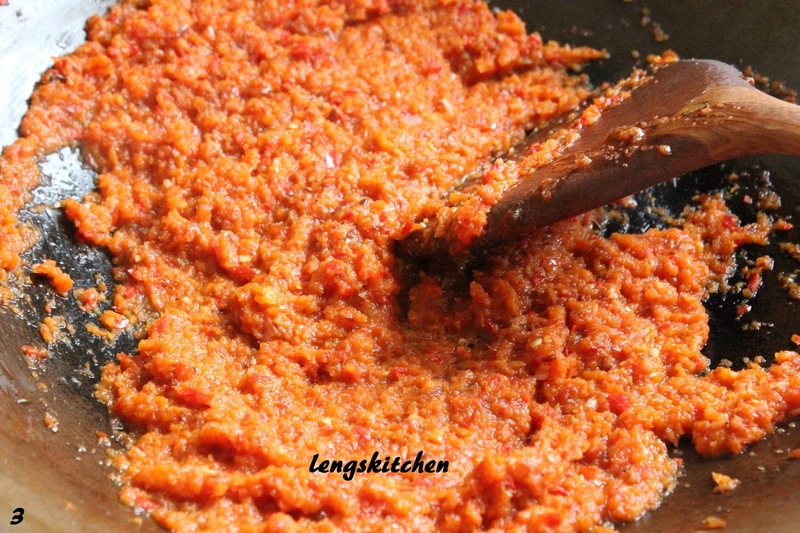 Add in the blended ingredients, sauteed shrimp paste (belacan), salt and sugar and fry until aromatic and slightly browned (about 5 to 7 minutes). 4. Add in the tamarind juice next and continue to stir fry for another 10 minutes until the color darkens a little further and the mixture gets slightly drier. Dish out and set aside to let cool. 5. 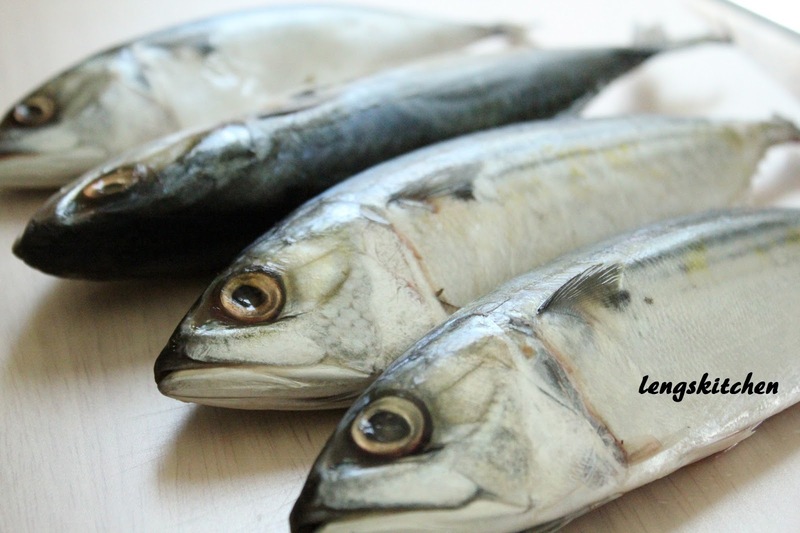 Working with a fish at a time, make two slits lengthwise along its back, one on each side. Make deep cuts close to the ribs to make two pockets good for stuffing. 6. Using a butter knife, stuff the sambal paste into each pocket generously. Level and smooth off the sambal at the brim. Let rest on a plate lined with paper towels, cover and let marinate for at least an hour in the fridge. 7. Heat up about 1/4 cup of cooking oil in the wok over high. 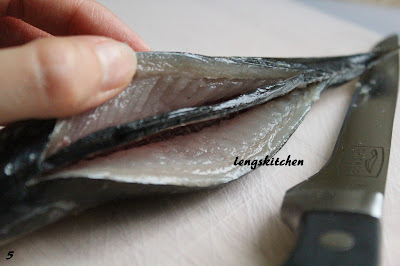 The oil should at least cover the bottom half of the fish comfortably. 8. Make sure that the oil is well heated prior to frying. 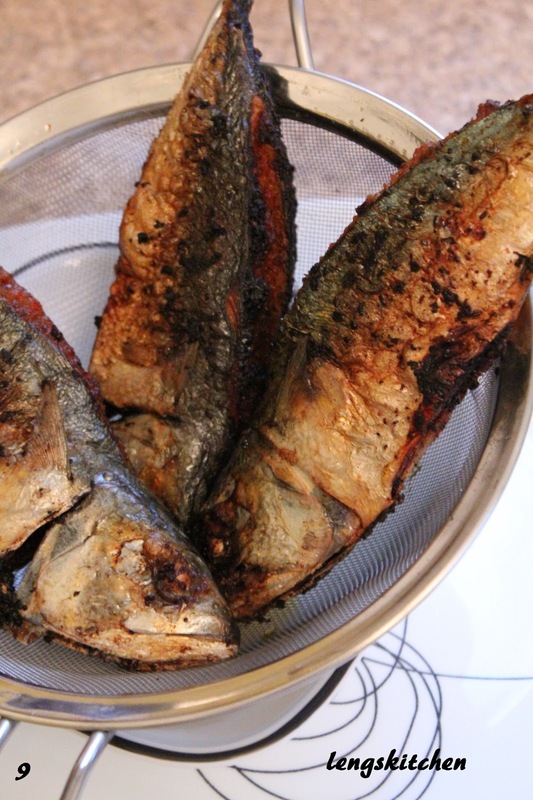 Turn the heat down to medium, and carefully slide in the fish side by side. Leave a little gap in between them if possible. Fry for about 10 minutes (or more until lightly charrred) before flipping them over to fry the other side. Avoid flipping over too many times to prevent the sambal from getting displaced. 9. Remove from wok and let rest on a sieve (to allow excess oil to drip off). Transfer to a serving plate and serve hot. Satu ekor is not enough for me, dua baru cukup! hehehe..
Yea, those bones can be pretty nasty! What is sautéed shrimp paste? Is it sauteed toasted belacan?